At Best Buy Automotive, we offer a large selection of sand blasters for everything from small to large projects. Whether you are an at-home mechanic working on your own automobile, or you own an automotive shop, we are confident that one of our sand blasters will meet your needs. If you are looking for a smaller and more economic but still powerful machine, take a look at the Keysco Siphon Feed option from ALC. This machine has an 80-125 PSI and has a 50 pound capacity. It is easy to move and simple to operate. It includes three steel nozzles and three air jets, and it comes with a two year warranty. If you are looking for a more powerful machine, the Keysco 48” x 28” Steel Floor Model option by ALC is a great pick. It features heavy duty 14 gauge steel and welded seams. It is great for use in larger shops. This machine can take anything you throw at it. These two sand blasters are not your only options when you are shopping at Best Buy Automotive, so take a look through our entire selection. We have detailed descriptions and specifications available for each of our items. However, if you still need more information, you can give us a call or come by one of our stores. 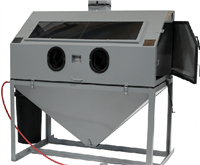 We would love to help you pick out the perfect sand blaster for your home or business. We offer 6 month 0% interest financing, so you can get the items you need without dealing with high interest rates. We have been in business since 1987 for a reason. At Best Buy Automotive, we offer friendly and helpful customer service, and we bring you only high quality and well-crafted products from top brands, at some of the best prices on the market. So give us a call or come into one of our stores today, and let us help you solve all of your automotive problems in a quick and hassle-free manner.